How is it almost Halloween already! It seems like this year has gone by SO quickly and one of my favourite holidays is right around the corner (I can't wait). I love watching unusual, paranormal and spooky films and TV series all year round but especially during the autumnal months. I think that this series is the most well know of my recommendations and it's perfect for this time of the year because vampires, come on, they are the quintessential Halloween creatures. I watched half of the first season in my final year of university but with my dissertation I didn't have time to finish it; I'll have to get round to it this Halloween. I know so many of my friends love this series and I'm all for watching it just because of Ian Sommerhalder to be honest! Again, this is another series that I've started but not finished yet, it's available on Netflix which is were I first heard of it. It's again about vampires, which are probably my favourite paranormal creatures. There are three full seasons available now so there are more than enough for a Halloween night binge. There's a theme with this post, I've watched the first episode of iZombie and liked it although I watched it just after reading Warm Bodies and it seemed far too similar so I wouldn't recommend read/watching them closely together. I like the premise, the main actress and isn't scary so perfect if you are like me and don't like jumpy or very scary tv shows. This is a show I've seen quite a lot about recently on Twitter and I'm definitely interested to check it out, especially as it has Tom Ellis as the lead and I loved him in the Miranda series - although I've no idea how he'll be in this! It looks interesting and a bit sarky so I'm sure I'll love it! Onto my only really creepy pick for Halloween this year and oh boy is it disturbing at times! I adore Eva Green so I definitely wanted to check this series out when it was first aired and I fell in love. I've watched the first and second seasons and it has the main thing I love in tv series - characters from classic fiction as in this there's frankenstein and his monster, werewolves, Dorian Grey, vampires (spoilers) and more! I cannot recommend it enough although if you don't like gore, creepy dolls, possession/demons etc then probably don't watch! Check out my twitter to enter to win series one of all four series in the photo above - UK only! ENDS TOMORROW! 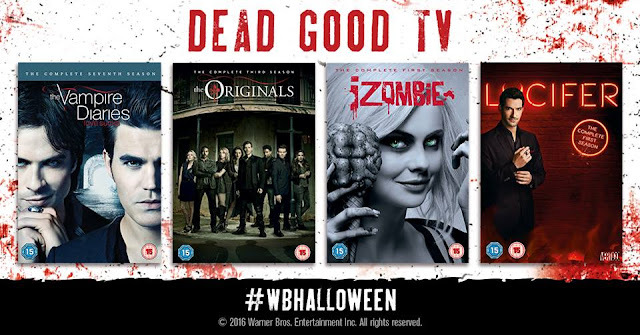 Do you have any Halloween TV/film recommendations? Have you watched any of these? Ian Sommerhalder... Can´t go wrong with TVD! These sound great! Thanks for the recommendations. After Twilight I´m very much afraid to start anything that has vampires in it. I do like iZombie though! I´ve only seen a few episodes so far but the lead actress was in a podcast and I think she´s brilliant (even though they stole her New Zealand accent!). I definitely need to watch more of this one. Girl, you have to watch Lucifer! I just started it the other day and it's so good! Penny Dreadful oh my god, great choice this show quickly became my number one favorite. Definitely perfect for this month! I have saved this blog post to try new shows. yay! !